Looking for something fun to do between Disney vacations? I’ve got just the show for you. 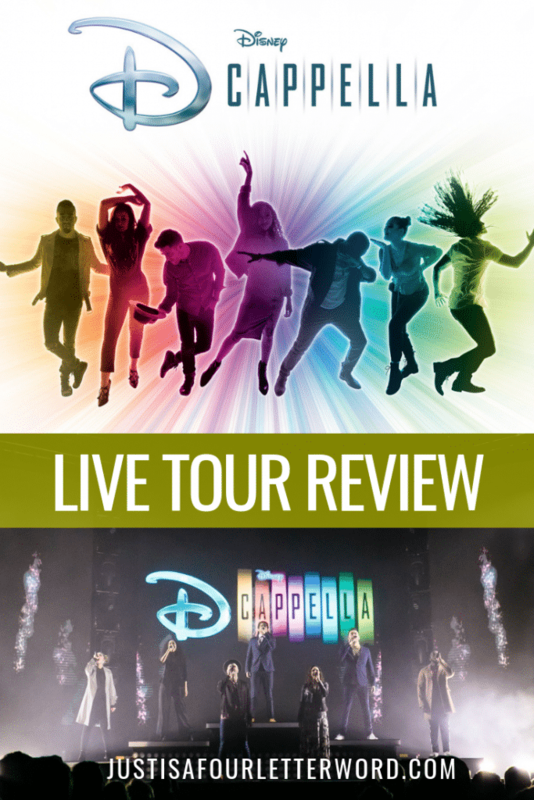 We recently saw DCappella live on tour and it was the perfect Disney fix without having to travel! If you love all things Disney like we do, that probably includes Disney movies and Disney music. DCappella is a combination of both! With amazing A cappella vocals singing classic Disney songs, your family is in for a real treat. My family was provided with complimentary tickets to this event. All opinions are my own. This post contains affiliate links which means I may earn money if purchases are made using my links. DCappella is an A cappella group made up of 7 vocalists who use only their voices to recreate classic Disney songs. This means there are no instruments at all. Each person has a specific role to play and together it’s amazing what they can do! The percussion was our favorite but everyone was insanely talented. 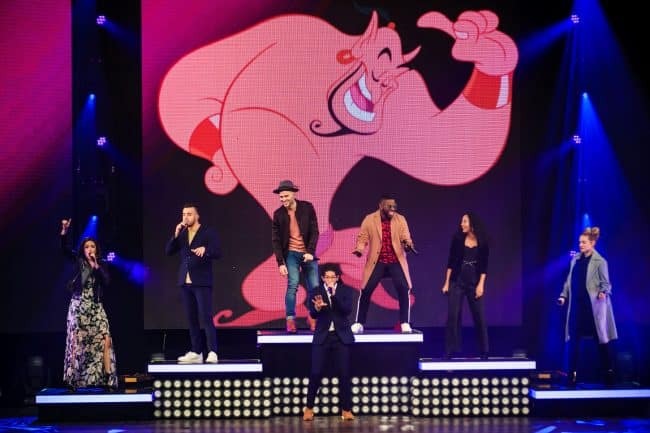 DCappella is made up of Sojourner Brown (alto), Orlando Dixon (baritone), Antonio Fernandez (vocal percussion), Morgan Keene (soprano), Shelley Regner (mezzo), Joe Santoni (bass), and RJ Woessner (tenor). 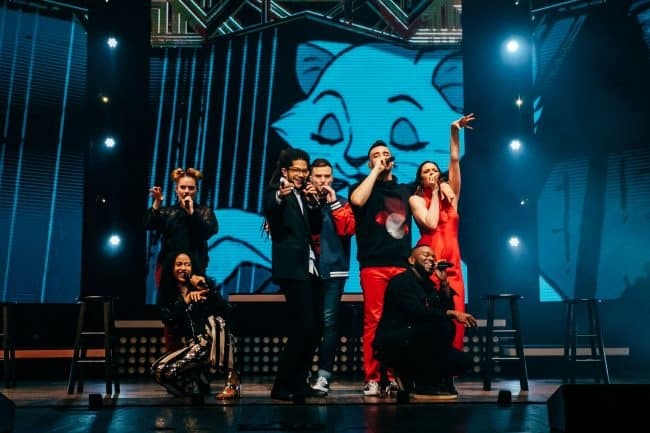 DCappella is 100% kid-friendly and I love that! We are always looking for ways to expose our boys to live entertainment and this was the perfect fit. The set list was a combination of music from older films like The Aristocats to new classics like Moana. There really is something for everyone. I will admit that our youngest really fought the idea of a “musical” even though he has been to other shows. But once he had some dinner and settled in, he was ALL about it. He was even jumping up and down clapping at the end, which was totally adorable. The beat-boxing was a huge hit with all of us, but especially our 10-year old. We all had a great time and if you want to know more, check out this video for a little sampler. How long is the DCappella Live Show? We saw the live show here in NC at the Durham Performing Arts Center. If you include the opening act, I would say our show was right about 2 hours long plus a 20-minute intermission. The show started at 7:30pm and we were heading to the van by 10pm. Speaking of the opening act, we were very pleasantly surprised to see a local(ish) Barbershop quartet sing a few songs to warm up the crowd! We are big fans of barbershop (shout out to the Dapper Dans) so that was really fun to see. Each location has a different opening act so be sure to check out the site to find out the one near you. DCappella Live is still touring for a few more weeks so if you haven’t seen them yet, there is still time! Check out the tour locations to find a show near you. And if you don’t see one, you can always grab the album! To learn more and see some fun behind-the-scenes action on the DCappella live tour, be sure to follow the group on Facebook, Twitter, and Instagram. When you don’t live near a Disney park, sometimes you just need a little Disney magic. A big thanks to DCappella for bringing the magic to us!